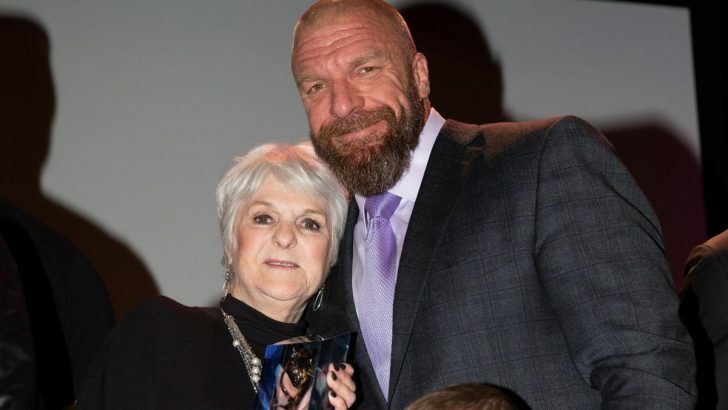 Sue Aitchison, a 30-year veteran of WWE’s corporate office, has been named the recipient of the fifth-annual Warrior Award. Named after WWE Hall of Famer The Ultimate Warrior, the Warrior Award is presented to an individual who has exhibited unwavering strength and perseverance and who lives life with the courage and compassion that embodies the indomitable spirit of The Ultimate Warrior. The award will be presented to Aitchison by Dana Warrior at the 2019 WWE Hall of Fame Induction Ceremony on Saturday 6 April at from Barclays Center in Brooklyn, N.Y.
Sue is widely credited with spearheading WWE’s community outreach programs. Over the course of her storied career, she built a long-term partnership with Make-A-Wish and helped grant WWE wishes to more than 6,000 children. Aitchison also pioneered WWE’s WrestleMania Reading Challenge, inspiring a love of reading for millions of children around the world. Because of her commitment to giving back, Aitchison has also been the recipient of Make-A-Wish’s Chris Greicius Award. “Sue has dedicated her entire career to helping Wish kids fulfill their dreams and putting smiles on countless families’ faces. Her heart and character epitomize the essence of the Warrior Award,” said Stephanie McMahon, WWE Chief Brand Officer.